Legionella Control Internationals innovative rapid legionella testing kit, LegionellaFast uses the latest “rapid-test” technology to detect Legionella bacteria in water. It is a quick and easy to use DIY tester that will deliver an accurate, straightforward YES::NO test result on-site in only 25 minutes. 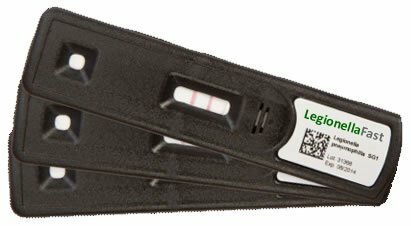 LegionellaFast is an innovative rapid legionella test that needs no laboratory and is designed to give accurate in-field test results in only 25 minutes. It is the fastest legionella testing method commercially available on the market today. LegionellaFast test is ideal for testing almost all water samples from sources including domestic hot and cold water systems, taps and showers, spa pools, water features, cooling systems and many other applications where Legionella bacteria may present a risk to safety and health. Take better control and improve your overall legionella testing, monitoring and risk management procedures with our state-of-the-art in-field legionella test. LegionellaFast uses a Lateral Flow Immunochromatographic Assay (LFICA) to detect the presence of cell surface antigens from Legionella pneumophila serogroup 1* in only 25 minutes. Once suitably filtered, the presence of the antigen in a water sample causes the “Test Line” to turn red in colour. A “Control Line” is also included which should always turn red if the test has been performed correctly. LegionellaFast has been designed to test waters to a sensitivity of 100 CFU/L making it ideal when access to a legionella laboratory is impractical or speed is imperative. LegionellaFast should be used to support your existing legionella risk management procedures and sampling programme and should not replace routine laboratory analysis. LegionellaFast has been tested with a range of common biocides and biodispersants used in legionella control, at their normal maximum concentrations. The test should not be used on water systems treated with biguanide or THPS based biocides. Do you need UKAS accredited laboratory testing? *Legionella pneumophila serogroup 1 is the causative organism responsible for 88% of all cases of Legionnaires’ disease – The European Centre of Disease Prevention and Control (ECDC) Report – 2011. Rapid legionella testing kit LegionellaFast is an accurate DIY test for legionella bacteria in water. YES:NO results in 25 mins with our legionella tester.